Bart R. Leib & Kay T. Holt (edd. ), Resist Fascism. Crossed Genres Publications, 2018. Pp. 95. ISBN 978-0-9913921-4-8. $9.99. 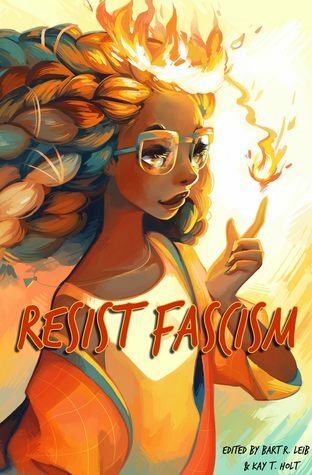 Resist Fascism is a micro-anthology, published by Crossed Genres last November after a successful Kickstarter. The idea was to put together a little squad of rebellious stories to be distributed just in time for the US midterm election. What I liked the most in this project is that, as editors Leib and Holt explain on the back cover, the anthology is based on the principle that you don’t need to be a hero to resist, and even actively oppose, fascism. Fighting oppressive and unjust regimes does not necessarily mean joining an armed guerrilla and blowing up bridges; it can be a small act of disobedience, or any other way in which someone chins up and refuses to follow a law or a system they believe unfair. In other words, resistance is for everyone. We don’t need to wait until we are ready, we already are. The stories in this anthology show a remarkable variety of settings and literary genres. If thematic anthologies can sometimes feel a bit repetitive and limited, this one, on the contrary, takes the reader from grim cyberpunk sunless streets (like in “To Rain Upon One City”) to fancy brunch bars where they serve mimosas and avocado on toast (“Ask Me About My Book Club”), passing through interstellar trips (in “Meg’s Last Bout of Genetic Smuggling”) and dinosaurs (yes, dinosaurs can fight fascism too—or at least help—in “Pelecanimimus and the Battle for Mosquito Ridge”). The number of stories here collected is quite contained, and the average length is also on the short side. When you finish this book you will probably find yourself wanting for more. The variety of register is refreshing: some stories are quite are somber, other almost comical. But don’t get me wrong: the regimes the protagonists of these stories are fighting against are serious and outrageous, and the dangers they are facing, even for their less obvious rebellions, are entirely real. Saying that you don’t need to be a hero to resist fascism doesn’t mean there are no risks. People die in these stories. They disappear, or end up in prison. It is never without consequences to join the resistance. I come from a culture where fighting fascism is a very serious topic. It has left deep scars in our history and we tend not to joke about it, not to take it lightly. When we talk of resistance, we think of partisans who died in ambushes, who were captured and tortured, we think of the masses of people who were killed in retaliation. It is our way to cope with it, to prevent it from ever happening again. It was never a perfect or an effective plan, but we tried. Recent history tells us that we failed. And the current political situation, almost everywhere in the world, suggests that we need to find new and better strategies to engage people. That’s one of the things that I liked best about this project. Maybe it is fighting with a smile that will help us. It is talking about anti-Franco dinosaurs or witch librarians that will enable us to reach more people, to explain why it is important to keep fighting. Resist Fascism is the product of a great idea, and deserves to be loved, even though the little time the editors had to put it together is reflected in some limitations. It is a slender book that you will read quickly and with pleasure. Also, it is perfect to be smuggled and used to find new comrades! Great review! Thanks for letting us know about this. Thanks Su, I'm glad you enjoyed it. Take care!